Husky lovers, meet Shylo! He is a handsome 6 years old husky mix that is neutered, fully vaccinated, and microchipped. He would do best as an only dog or with a friend (female dog preferred or older male dog). He would benefit from training with meeting other dogs especially other males and most importantly when he is on leash. Shylo has been in a home with a cat and his foster mom�%A0said that he was interested in the cat but did not chase her. It will be up to the full discretion of the adopter where a cat is concerned. Just because he did well with his foster's cat doesn't necessarily guarantee he will with yours so please keep that in mind. He rides okay in the car and is always on the lookout of where you're going. With that said, he's a bit antsy in the car and doesn't lay down or sit while riding (crating him in the car is recommended). Shylo does okay on leash; he's very strong and is a puller especially when he sees another dog. He will need work with leash manners. Shy does great in a crate and will lay down in it with no issues. We'd prefer him to go to a home where you work from the house, he can go to the job site with you, or you're retired but this can be discussed if the conditions are right. A 6' fence minimum as he has no trouble jumping anything lower. Shylo does great with people and kids; due to his size and energy we're asking for a household with kids 8 years old and up. Shylo is such a lover and really enjoys cuddling in your lap while watching TV. Don't let his age fool you, he has plenty of love and energy left in him! We are asking for people interested in him to have husky/Northern Breed experience. Again, he would definitely benefit from training cuz old habits die hard! If you're interested in an older man to spend your days and nights with please contact us today! 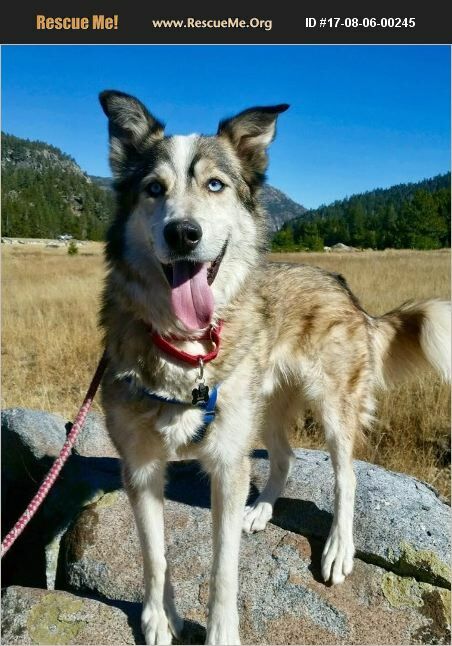 Also, if someone adopts him in the Northern Nevada/Lake Tahoe (CA side)�%A0area, Tahoe Husky Rescue will pay for a training session with Ideal Canine for Shylo and his new adopter!! We want you to know exactly what he was taught and get a hands-on experience that will benefit you both! !